Images are the important part of Blogging and if you use them wisely. You cna use your picture to create backlinks and also to get traffic. Now today We will discuss about how to use images to drive traffic from Flickr. Let`s talk about Flickr traffic first. You can use Flickr iPhone app or Flickr desktop unloader or other ways to upload your pics to Flickr. Flickr is a high PR site. Its Pagerank is 9. 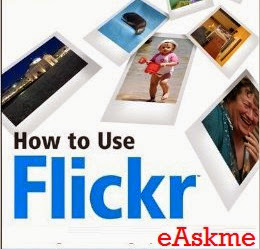 You can get backlinks from Flickr using Anchor text and it will be a great advantage Flickr has added nofollow attribute to all external link recently, But it can drive huge traffic from Flickr. Run Flickr Uploader, give tags, Title and description. Use proper tags to get targeted traffic. Select all images and click on "Upload". Feel free to use this image but give credits to http://www.eAskme.com. Add your domain name also. This will help you get long term traffic. Traffic from Flickr may not be huge but it will surely drive some good traffic to your blog. This worked for me, so you also try and see how good it work for you. You can easily do image search to find if someone using your image, if someone do then that person must give you credit. If you do have any question feel free to ask me. If you find this post useful, don`t forget to share on Google Plus and twitter.